(CNSNews.com) - President Trump's long-simmering indignation about the Trump-Russia investigation erupted in a series of tweets over the weekend, many of them quoting other people who agree with Trump that the whole thing is a witch hunt -- and that the real story is being ignored. 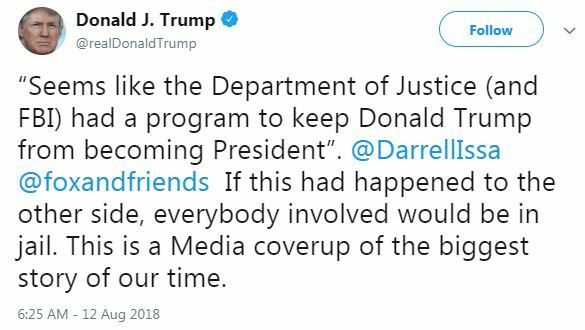 “Seems like the Department of Justice (and FBI) had a program to keep Donald Trump from becoming President,” Trump quoted Rep. Darrell Issa (R-Calif.) as saying on "Fox & Friends." "If this had happened to the other side, everybody involved would be in jail. This is a Media coverup of the biggest story of our time," Trump commented early Sunday morning. 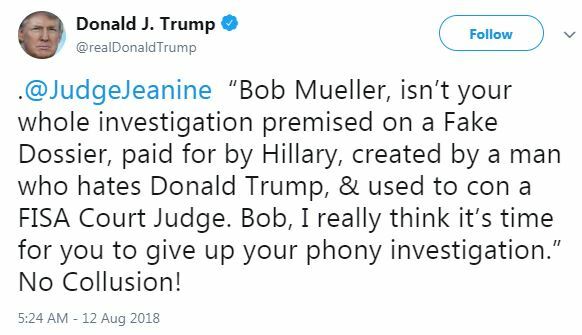 Trump also quoted Fox News's Jeanine Pirro as saying that the Mueller investigation is "premmised on a Fake Dossier, paid for by Hillary, created by a man who hates Donald Trump & used to con a FISA Court Judge. Bob, I really think it's time for you to give up your phony investigation," Trump quoted Pirro as saying. "No Collusion!" Trump commented. "Do you believe Nelly worked for Fusion and her husband STILL WORKS FOR THE DEPARTMENT OF 'JUSTICE,' Trump wrote. "I have never seen anything so Rigged in my life. Our A.G. is scared stiff and Missing in Action. It is all starting to be revealed - not pretty. IG Report soon? Witch Hunt!" 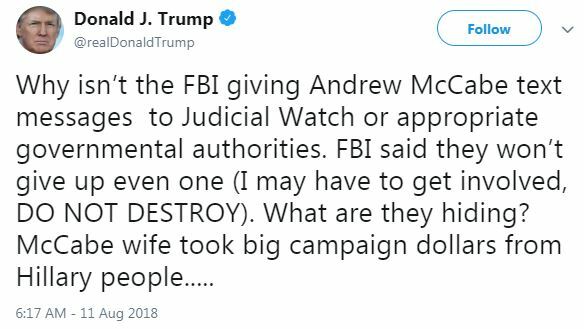 In another Saturday tweet, Trump said he may have to declassify some of Andrew McCabe's text messages if the FBI doesn't turn them over to Judicial Watch or congressional committees that have subpoenaed them. "FBI said they won’t give up even one (I may have to get involved, DO NOT DESTROY)," Trump wrote. "What are they hiding? McCabe wife took big campaign dollars from Hillary people....."
"The president is frustrated that the attorney general recused himself in early March of 2017 from anything having to do with the campaign," Conway responded. "And what the president really wants, if you look at all of his tweets and don't just cherry pick them, the (inaudible) of his tweets, Jon, are that he wants to make sure we're investigating all sides of the, quote, so-called Russian collusion. "I've noticed that the media is almost silent about these new revelations that Christopher Steele and the number four at the FBI, Peter Ohr and his wife Nellie working for Fusion GPS. I don't want Americans to get so confused at this convoluted mess to miss the essential point here, was that the pro-Hillary people were so afraid that they needed to prop her up, that she was such a non-compelling, non-persuasive pathetic candidate that they had to dig up dirt on Donald Trump early on--"
"Well, how in the world will I know the answer to that question?" Conway responded. "I'm not answering questions as to who will be in the White House at the end of the year. That's a crazy question. You just want to roll the tape sometime. "I think the fundamental point here is that the attorney general is doing great work on law enforcement, on -- on pushing back on MS-13 gangs, on his SOS which is his Synthetic Opioid Surge task force, working with the new D.A., acting director. But he has recused himself from this. And the president rightfully wants to -- wants America to see that this Mueller investigation comes to a conclusion in a timely fashion. So far no Russia collusion proven. And you know it. "You know I was the campaign manager for the winning part of the campaign. I never talked to anybody in Russia. I talked to people in the Macomb County, Michigan and Mecklenburg County, North Carolina. Not Moscow. You know it, there's no collusion. Paul Manafort's on trial, has nothing to do with the campaign, Russia, collusion, the judge warned everybody not even to say those words."